1889, New York. 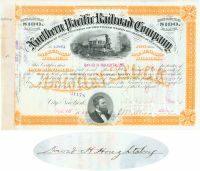 Stock certificate for 100 shares. OrangeBlack. Engraved vignette of a steam locomotive at top center, nice portrait vignette of Frederick Billings at bottom. Issued to and signed on verso by DAVID HARRISON HOUGHTALING, tea merchant, born in Kingston, N.Y., May 17, 1834. After leaving his books in Kingston academy, the young man found a clerkship in New York city in 1850. A hardworking, honest youth, he made excellent progress, and in 1860 began the importation of tea on his own account. A splendid merchant, he has always been successful and has been prosperously engaged in this trade until the present time. A man of fine character, he has been elected a director in The Bank of North America, The United States Life Insurance Co., and The Third National Bank, of this city, a trustee of The Franklyn Trust Co. of Brooklyn, and director of the Richmond Railway & Electric Co., and many other corporations. He is a Republican in political faith, and served two terms as Park Commissioner under Mayor Seth Low, but steadily declined public office afterward . Stamp and Punch cancelled and very fine.